Well then... I'm just not telling... so there! Neener, Neener, Neener! I feel very awkward opening this thread. Pete the über-horror-fan setting out to watch two weeks worth of romantic films seems odd (*shudders*). To be clear, just like Jimmy pointed out, it's not about the romantic films, it's about doing two weeks of them! Hey... I enjoy a little of it all! I know 2 weeks may be a bit much... but the idea popped in my head and I just had to try it. Besides... there is a couple Romantic Horrors (Damn... that is a term I never thought I would type) in there! Next thing you know, he'll be scheduling a "musicals" marathon! Due to a love spell gone awry, all the women in Sunnydale find themselves attracted to Xander. All women, that is, with the exception of Cordelia. I enjoyed this one. I thought it was a fun way for the show to do a Valentine's Day episode. Definitely good for a few laughs. 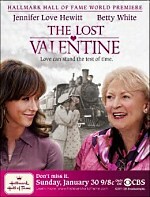 Based on the novel, The Last Valentine, by James Michael Pratt. A young and cynical female journalist learns love may transcend trials and time as she discovers a story that will change her life forever. When war separates lovers on their wedding anniversary Feb. 14, 1944 at LA Union Train Station, Navy pilot Neil Thomas makes a promise he isn't sure he can keep - to return to the train station safe by their next anniversary. This is a movie I recorded off TV about a week ago or so. It is a pretty good movie. I did enjoy it. I liked seeing both Betty White and Jennifer Love Hewitt in this one. It is a sweet and touching story. But it did seem a bit slow at times. I don't have Sleepless in Seattle... but I do have You've Got Mail. So I could probably get that one in as well. I do plan on getting to that one... It is one I never seen but always heard good things. This is a movie I saw on cable not all that long ago... along with it's two sequels. And at that time I enjoyed every minute of it. Watching it for the second time today I enjoyed it just as much as the first. I really like the character of Cassandra Nightingale (The Good Witch) and the lovely Catherine Bell did a wonderful job in the role. I couldn't imagine anyone doing it better. If there is anything I didn't care for though... it would be that the ending felt like it was settled a little quickly and easily. But that didn't really take away from the movie for me. After watching it the first time on Cable I was quick to see if these movies were on DVD. I was thrilled to find this one and ordered it on the next order I made. But unfortunately the two sequels have not been released yet. Hopefully they will be before too long. Also unfortunate is the fact that this DVD release has no extras what so ever. Inspired by the other comments I looked at your list and picked the above as a MUST-SEE for this marathon! The Good Witch sounds interesting. I've never heard of it before though.